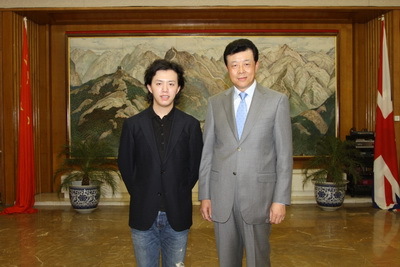 On March 25, 2011, Ambassador Liu Xiaoming met with young Chinese pianist Li Yundi at the Embassy. Mr. Li briefed Ambassador Liu on his current visit to the UK and talked about his plan of performance in the coming years and the relevant ideas. According to Li, the strongest impression he gets from Chopin's works is the patriotism and national feelings. In fact, many modern and contemporary Chinese piano pieces were created against a background similar to that of the works of Chopin. In the future, while inheriting the tradition of Western classical music, he will focus on Chinese music and mainly perform some piano works with national features which reflect the spirit of China to allow the audience around the world to appreciate Chinese music. He plans to release an album named "RED PIANO", a collection of "Yellow River Piano Concerto" and other heart-warming classic pieces. Ambassador Liu commended Mr. Li's great efforts in promoting the Chinese music. He believes that an artistic expression blending Chinese and Western styles will help the public in the rest of the world to better appreciate Chinese music and feel the charm of Chinese culture and contribute to the mutual understanding and friendship between China and the West. The Ambassador wished Mr. Li new progress in the exploration to combine Chinese and Western music and hoped that he would contribute to the cultural and artistic exchanges between China and the UK, and said that the Chinese Embassy is ready to provide active assistance. Li Yundi is a famous young pianist in contemporary China. In 2000, he won the First Prize at the Fourteenth International Frédéric Chopin Piano Competition as the youngest and the first Chinese winner in the history of over 70 years of this award. In 2010, the Polish Ministry of Culture awarded Li Yundi the Polish Honorary Medal of Arts and Culture in recognition of his prominent contributions to the promotion of Chopin and classical music.